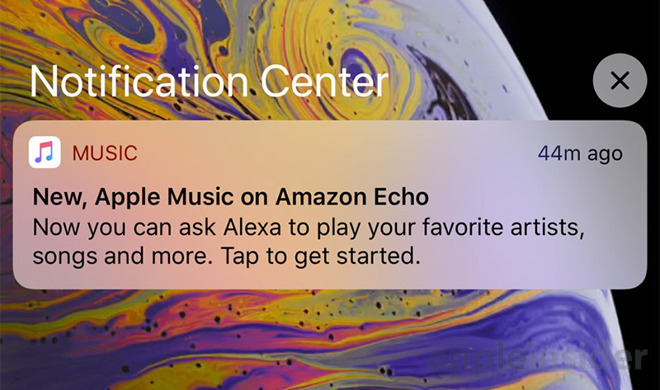 For the fourth time in less than two weeks, Apple has used the push notification mechanism of a native iOS app for what amounts to an advertisement, this time touting Apple Music compatibility with Amazon's line of Echo devices. Apple Music push notification touting Amazon Echo compatibility. Apple Music subscribers saw push notifications promoting the service's new Echo integration pop up on their iPhone, iPad and Apple Watch devices on Monday. The alert, once a rarity for Apple, raised eyebrows, as a number of users posted screenshots of the message to social media outlets like Twitter. "Now you can ask Alexa to play your favorite artists, songs and more. Tap to get started," the notification reads. Amazon first announced Apple Music integration with its line of Echo speakers last month, saying control of the music service would be added as a "skill" for its Alexa virtual assistant on Dec. 17. The skill went live for some in the U.S. late last week, while others in the country gained access on Monday. Similar to Apple's HomePod, users deploying Apple Music on Echo can ask Alexa to play songs by title, tracks from artists and custom curated playlists. Genre-based radio stations and Apple's live Beats 1 station is also available. Today's notification is the fourth such alert Apple pushed out from a first-party app this month. The first arrived on Dec. 7, when a notification urging iPhone owners to upgrade to iPhone XS and XR was sent from the Apple Store app. That same day, Apple Music sent out a message promoting an episode of its original TV show Carpool Karaoke featuring Kendall Jenner and Hailey Baldwin. Carpool Karaoke was again the subject of a push notification last Friday when Apple Music peddled a new episode starring Jason Sudeikis and The Muppets. While not a glut of messages, the practice walks the line of Apple's own App Store Guidelines, which in section 4.5.3 prohibits developers from using Apple Services to "spam, phish, or send unsolicited messages to customers." I've thought for some time now that the day that Apple purchased Beats and seriously delved into the content industry will go down as the day Apple lost its soul. The iPhone Music app fine for using Apple Music streaming, but it seems to want to fight you over managing and using your own music. At that point, it's not longer an iPhone - it's an Apple Phone. The "i" is ... maybe not gone, but it's being shown the door. The trend isn't just limited to the Music app. The iPhone (and Apple Watch) seem to want to decide what I want to do at any given moment, and they do a very poor job of it. Sadly, as the hardware begins to mature and no longer sustains aggressive update cycles (as happens in any industry), expect this to get much, much worse. Hopefully Apple finds their way back at some point, or at least stops trying to ram this down our throats Microsoft-style. Putting Amazon Music on Echo is like the HomePod waiving a white flag of surrender. I love how they are unifying. We all need to unify compatibly. Puzzling behavior. Apple needs to review this in tandem with its emails. (I had to turn off all Apple emails because I couldn’t control the granularity within the four options, so it became irritating. I’ve turned off most notifications, so did not experience these.) If they could reach the Alexa users who don’t own iPhones then such a push would be great... but don’t see that unless Apple buys Amazon ads. desperate. less hardware sales means more services pushed onto the user. Apple putting Apple Music on Amazon devices makes no sense to me. It does nothing to enhance Apple’s ecosystem. All it does is allow you to stream music Apple doesn’t own using another voice platform. The amount of extra services revenue they’ll get is a rounding error on their financials. And who at Apple thinks it’s a good idea for the company to be promoting Alexa? WTF? I feel bad for the HomePod team. Apparently employees who work on that product didn’t know anything about this Apple Music deal with Amazon and are not happy about it. Most Apple iPhone users aren't fanatics who read Apple news sites and if you don't let them know their Amazon Echo plays Apple Music is a good thing. Think of how upset many would be if Apple didn't notify them of the new option? It doesn't bother me at all. Sadly only in the US. NOT in Canada. Actually a pretty keen observation. Amazingly engineered, overpriced flop. Apple isn’t interested in competing in the low/mid hardware space, but they still want to sell Apple Music subscriptions. I don’t see a conflict. It also helps them with the “I’m not a monopoly” argument. Apple putting Apple Music on Amazon makes sense after they have added Apple Music on Android. Apple Music is one service that Apple needs to gain as many users as possible, especially if they still wanted to compete with Spotify. This. I had no idea the Echo could play Apple Music. My wife actually had to tell me because I don’t really care about Amazon hardware. Was really hoping for a cheaper Apple alternative to the HomePod just to play music in the kitchen or bathroom. Looks like Apple is admitting the best way to do this is through their competitors hardware. Sure it won’t sound as good, but I’m not spending $350 on something that maybe gets 20-30 min of use a day. How is this really that different than Apple Music on Android or iTunes on Windows? The Echo has an overwhelmingly commanding lead in this market. The reality is there are many households that are all in on Apple but also have quite a few Amazon Echos around the house. Myself included. I want one of these devices in pretty much every room and that is simply not practical, not just from a cost perspective but also from a size perspective. They are simply to large for some of the places I have Echo Dots. The way I look at it, the HomePod is the equivalent of the iPod classic. It’s big, expensive, and more than most people want or need. The iPod really took off when the iPod mini was released. The HomePod is still waiting for it’s iPod mini equivalent. Wait, Did I read that right? Four times in two weeks... That’s a great way to squander good will. And it’s utter stupidity to risk alienating consumers when your ecosystem’s major attraction is premium treatment all day long. A big selling point for future intelligent assistants will be trust and RESTRAINT. Cook may have to cull a few bad apples. I have no desire to play in the Amazon (or Google) ecosystem. The point is this does not benefit the Apple ecosystem or help sell Apple hardware, to allow Apple Music on an Echo. It benefits only Alexa users and the Amazon ecosystem. Amazon stands to sell more Echo’s to existing Apple Music customers than Apple adds Apple Music subs. Apple will make penny’s off the Apple Music subs that may come. I want Apple to care about Siri and HomePod and this decision shows some short sightedness while not taking voice or their own product seriously. A year ago I would have said ‘Give apple time, once HomePod comes out they will put the resources into Siri’. Here we are and Apple is conceding the space for no particular reason. Maybe Apple knows something we dont RE: voice tech OR Jeff Bezos and his army 10,000 employees working on Alexa know something. I mean iTunes on Windows allowed Apple to sell a large volume of content. Which in turn sold iPod touches. Allowing Apple Music on a Echo will generate Apple penny’s. Apple couldnt even nogotiate to get Bezos to add AirPlay support to Echos in exchange? How many people are out there who don’t have an Apple Music subscription but will now get one now because it’s available on an Echo? Seems pretty minuscule to me. Right now HomePod is a rounding error in Apple’s revenues because of its price point. And Siri is more important than anything but apparently Apple would rather promote Alexa.